Since September 2012 there are CryptoParty events all over the world. The idea is to bring a group together and have each other teach the basics of cryptography and how to use the various tools that enable you to encrypt and protect information. Of course, encryption by itself cannot guarantee security, but it’s a part of the equation. Since cryptography is hard, most tools using it require a certain amount of knowledge to understand what’s going on and how to properly use them. The CryptoParty helps – in theory and most often in practice, too. If a CryptoParty is near you and you have some knowledge to spare, please take part and share what you know with others. DeepSec supports the local CryptoParty events in Austria, too. Finding a CryptoParty can be easily done by looking up your country in the wiki. 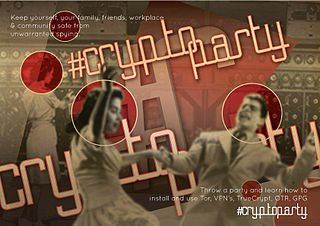 The next CryptoParty meetings in Austria can be found at the CryptoParty.at web site. This entry was posted on April 29, 2013 at 08:23. You can follow any responses to this entry through the RSS 2.0 feed. Both comments and pings are currently closed. 3 Responses to "Support your local CryptoParty"